I’m adorable. I get to say that, not so much because of me, but because I’m the proud owner of Mud Pie apparel and accessories. This Georgia-based company makes some of the most, well, adorable, lust-worthy clothing and travel goodies that you will ever find. If you love lime green and hot pink and stripes and prints and polka dots – this brand is for you. In fact, Mud Pie is great for anyone, but they’re especially handy-dandy for traveling women. Let me explain. Mud Pie offers a great attention to detail that travelers will appreciate, and items in wonderful fabrics and colors. So if you travel a lot – like I do – you will fall in love with the $28.50 Green Zebra Jetsetter cosmetic case. Why? Not only is this pink-and-green case sweet and chic, it also has a detachable clear outdoor case on the reverse. This exterior case is TSA-approved and can simply be snapped off when you go through security at the airport, with all of your lotions and potions that are three ounces or less inside. Brilliant! 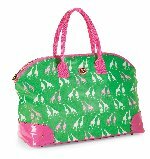 Another must-have accessory for traveling women – the $53 green giraffe Weekend tote bag pictured in this blog post, with pink handles and pink accents. If you ever wanted to make a fashion statement this is it. Unless of course, you’re carrying the $34 classic straw clutch. This cute little clutch purse features a ribbon of black or pink (and black polka-dot interior) with a handsome gold alligator or a shell or starfish adorning it. This is sure to be my new go-to gorgeous bag for my summer nights abroad, when I go cruising to Europe this summer. Two other perfect packables include a $25 pink-striped ribbon hat that is fully collapsible so it will easily stash in your Samsonite. I can safely smush it into my beachbag, yet it still snaps back and looks terrific. I can’t nap on the beach without it covering my face! And lest I forget, how did I ever live without my new $42 lime-colored crochet-accented cover-up? This divine, darling little dress with white-crochet trim is ideal – it’s fully lined — not only for the beach, but great for lunch dates, shopping and excursions, and is part of Mud Pie’s Beach-to-Bar collection. You’ll wear it everywhere. She is so right. And Mud Pie’s prices are so right. Even better, many of the items, such as the tote bags, sunglass cases, cosmetic cases and scarves, can be personalized with your name or initials. You’ll become a huge fan – and don’t forget, after you make a purchase, be sure to join the Mud Pie community on Facebook. There, you can swap stories about all of your favorite things. These are the types of fashion-forward items you’ll want to put in your own closet, as well as give as gifts, especially to your travel-savvy friends. As a Boston-based travel writer, take it from me. Whatever you do, don’t miss Mud Pie’s hanging travel cases, collapsible tote bags, jewelry cases and toiletries cases. They’ll all make every bon voyage – even better!